one of you whiteblazers needs to send that to ole smokey. I don't think it's even close to a UL option. I'm very open-minded but that's creepy. what's really disturbing is there is a degree in robotics anthropology apparently. Don't be too open minded, your brain'll fall out. Hmm... from what I saw on a HBO special about 10 years ago, there was a company that supplied non-robotic dolls. Cost was about $5,000 for the basic anitomically correct version. I thought the link was about them. So evidently they are 'merely' adding motors and a computer to ones already in use. it's often said that a cluttered desk is the sign of a cluttered mind. Of course the people who say this are the ones with an empty desk. And perhaps their minds are empty too. I believe my desk is more along the lines of my role model and hero William F. Buckley Jr. I heard it was messy desk empty mind and clean desk messy mind. Masturbation is far cheaper and more hygienic. I used to have a sign on my desk that said a tidy desk was the sign of a sick mind. Funny story time (well I found it funny anyway). At the time I had that sign I worked with a guy who was super tidy. Everything on his desk was always just "so". Ruler, pen, tape dispenser, phone, everything. One night after he went home I spent a bit of time taping everything in its place. The ruler, the pen, the phone. All of it. They wouldn't budge. When he bellyached the next day I just told him I was saving him the effort of putting it all back in its place at the end of the day. not when the masturbater puts his hand in your gorp bag. NO ONE puts their hand in my gorp bag. I may shake some out for them. I did not get norovirus. I used to have a sign on my desk that said a tidy desk was the sign of a sick mind.Funny story time (well I found it funny anyway). One tkime years ago one of my relatives, who get very tense and nervous around Thanksgiving, told me I had put the salt shaker back in the wrong place. I very obviously looked around the table for a spot marked 'salt shaker'. And I then said, "where ?". Mt relative moved it about 1/16 of an inch adn said, 'there!'. I asked the relative if they felt okay, and moved it back that sixteenth of an inch. I got threatened by a large wooden spatula, so I put it back. 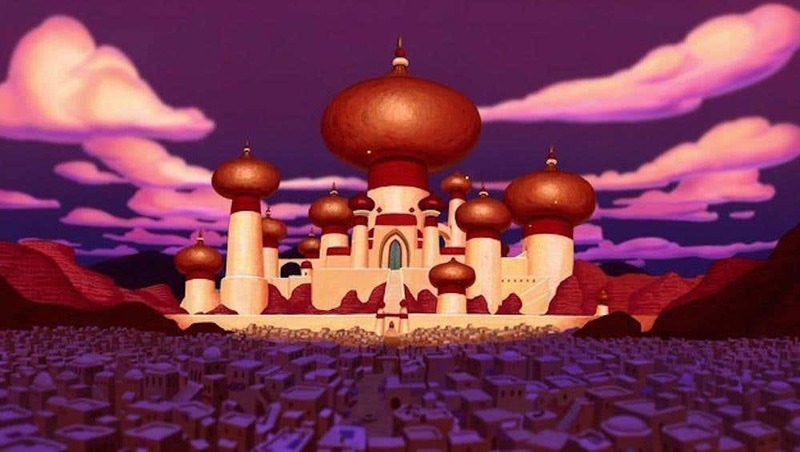 Thirty per cent of Republicans are down with bombing Agrabah, the fictional setting where the movie Aladdin takes place. Only 19 per cent of Democratic voters would do the same. Public Policy Polling, a Democratic polling firm, conducted the national survey that also found 13 per cent of Republicans and 36 per cent of Democrats would not bomb the city of mystery and enchantment. However, 57 per cent of Republicans were unsure whether they would bomb the location under The Sultan's rule. there's a few people on this site who can take advantage of this opportunity! I heard on the news that a guy trying to be the first to cross Antarctica unsupported dies 30 miles short of finishing...I don't know which would bother me more... hiking 1000 miles in the worst conditions on earth and then falling short of the goal by 30 miles... or dying. Yeah I saw that mentkoned on tv. Bothers me. Most certainly the shorting of the trip, you can die any day, but it takes real planning to pull off a trip like that. Man is completely out of touch with reality. is it politically incorrect to ask how a white guy happens to be a president of the naacp? Maybe a very distant relative? I'm not even 100% sure of what the T word is. At lease his wasn't faking it like the women up in OR or WA was. He was admiring a female reporters chest. I'll not fault him for that. at least he died doing something he loved. Do you dumpster dive for this crap, or what? of course. don't you remember? i met you in that dumpster last year when you were looking for music. I feel an ill wind rising in the cafe.